“This place is so beautiful; I could just wander the streets happily all day!” this thought often goes through my mind while traveling; especially in Europe with its beautiful cobblestone roads, unique buildings, and lively people. 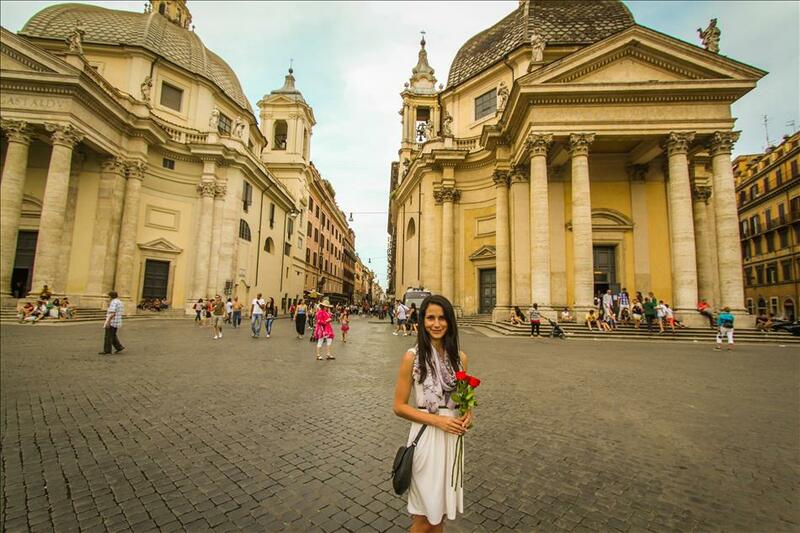 In Rome, I held myself to it and decided to take a walking tour of the city to see as many tourist hot-spots as I could in one day. No metro rides allowed; just taking in the sights while being carried along by my own two feet. I started the day out early due to jetlag (love it when jetlag works in my favor!) and headed to the Colosseum at 7 am. 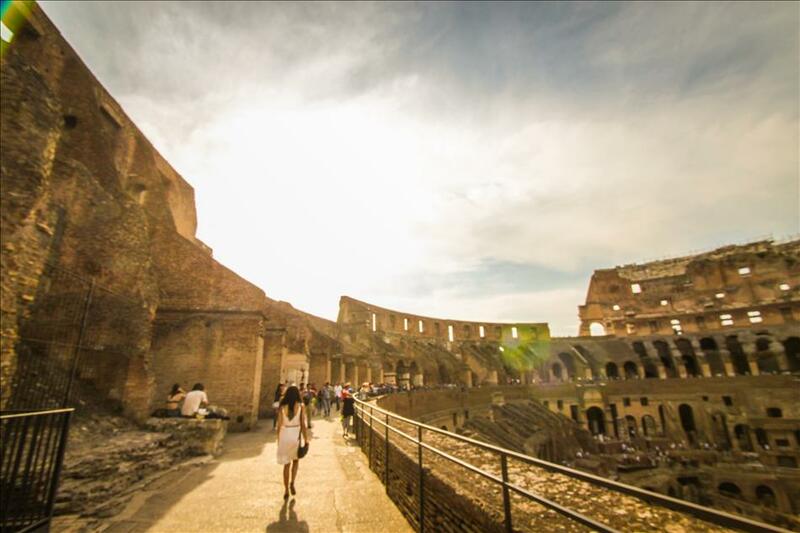 It’s best to go early to beat the crowds, and the early morning sun bathing the ancient arena in dawn light makes for a great photo opportunity. The Arch of Constantine is also gorgeous and without a crowd one can walk right up to admire the detail, and of course snap some shots. It was too early to go inside, but I wanted to see the inside of the Colosseum during sunset anyway to finish the tour. After grabbing some breakfast at a pizzeria (it’s never too early for pizza), the ticket booth for the Roman Forum and Palatine Hill was open. We paid for our tickets into the Roman Forum, Palatine Hill, and Colosseum then entered. 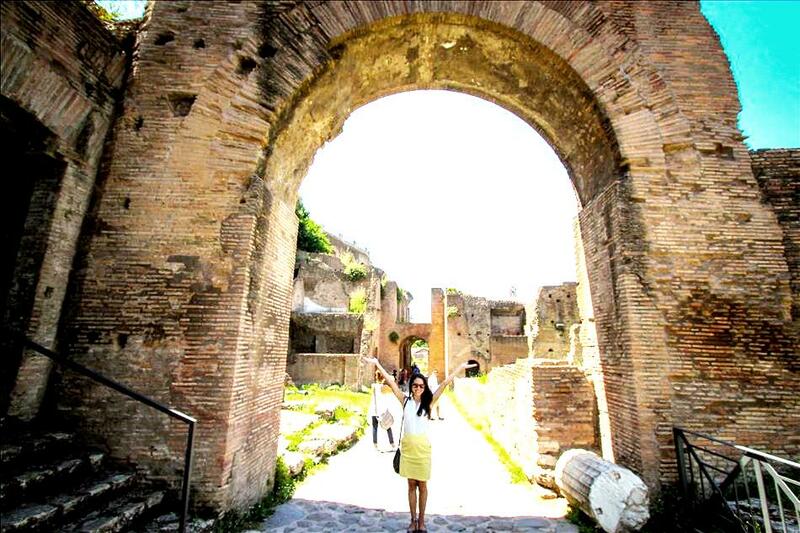 At the Roman Forum crumbling archways, columns, and brick walls comprise what was once the capital of the world. The ruins are still impressive and beautiful even though they’re just remnants of the vast wealth and magnificence that once stood in the area. The neighboring Palatine Hill was once a residential area for Emperors and the influential. The extravagant villas that once stood here were definitely MTV Cribs worthy in their day. What’s left now are some very tall retaining walls, courtyards with remnants of garden fountains, and the ghosts of ancient opulence. Walking around the large campus took a couple hours. There is so much to be seen and even more to be imagined. Entrance is free, and the interior is just as impressive as the exterior. Inside is a military museum, but what really caught my eye were the mosaics and artwork on the dome ceilings of different rooms, the marble work of the hallways, and the candlelit chapel. 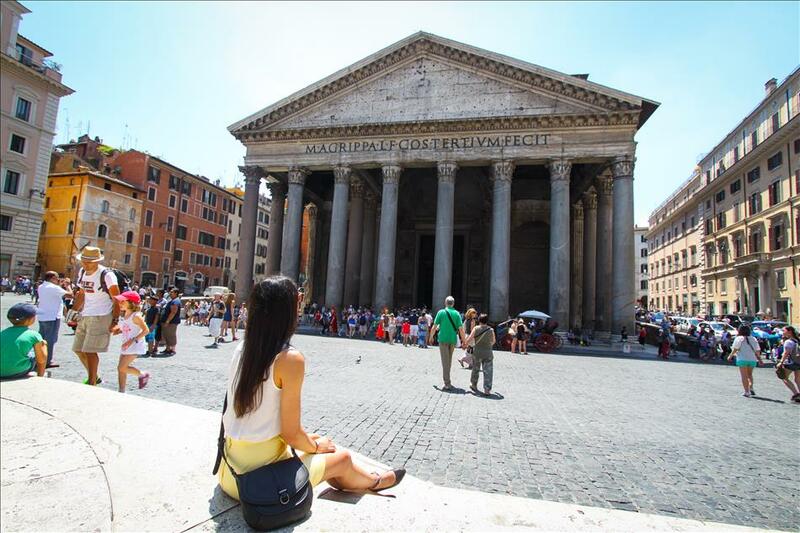 The Pantheon was the most breath taking place I visited in Rome. It has survived over two thousand years by luck and might through multiple restorations to be the best preserved ancient building in Rome. The Piazza del Popolo, Trevi Fountain, and Spanish Steps are all located very close to each other making the area a buzzing hub of activity. 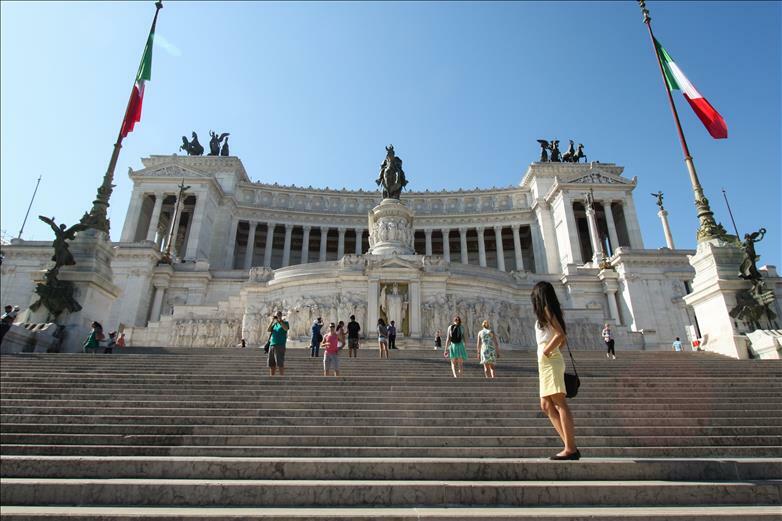 The Piazza del Popolo is the most famous piazza in Rome. It would have been totally amazing had its Apollo Fountain not been under restoration, but the Piazza was still lively and full of vendors, locals, and tourists mixing in the heat of the afternoon. Gelato shops frame the square tempting visitors to grab a cool treat and relax for a bit or people watch. The nearby Trevi Fountain was also getting a facelift when I visited; although scaffolding and gate did not stop tourists from tossing coins over their shoulders and casting wishes into the empty pool. The scaffolding obscuring these Roman icons was really disappointing at first, but gave me a convenient excuse to promise to visit Rome again. The neighboring Spanish Steps were thick with people picnicking, chatting, taking selfies, and watching the world go by. This was definitely the busiest place on my walk about. It was so alive with activity. To complete the loop, I circled back to the Colosseum. 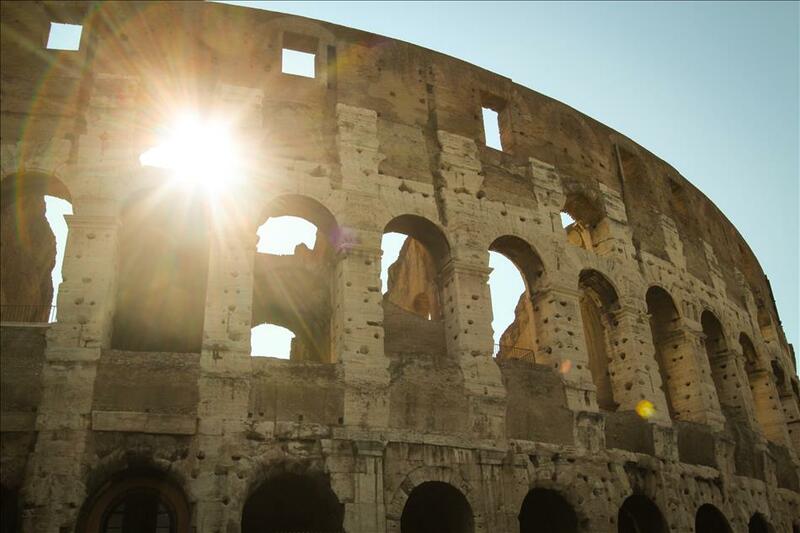 The sun burning low at the end of the day once again showered the Colosseum in gold and made the inside of the arena particularly beautiful with light penetrating the narrow maze of alleyways beneath. The mega-crowd of the afternoon had cleared off and we were free to meander until closing imagining ancient gladiator battles below. I walked around noticing a new piece of the arena to marvel at with each step. 15 miles (24 km) later, I tumbled into bed exhausted, but completely gratified by all the beauty I had beheld during my trek. I would definitely recommend doing this walking tour loop. Without getting lost and backtracking to my hotel to change outfits, it would only have been a little over 7 miles (11km); which is not too bad considering the city is gorgeous and you’ll feel a lot less guilty about eating pizza, pasta, and cheese for every meal. 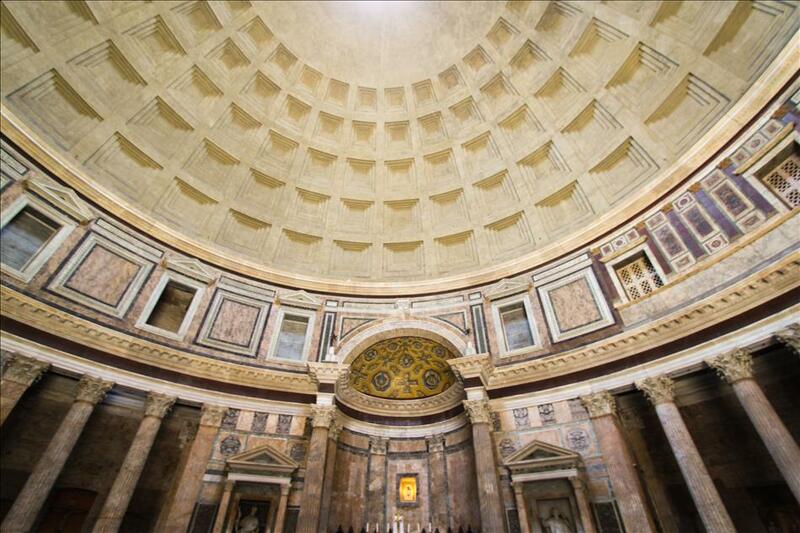 Plus, it’s a great way to Carpe Diem and Veni Vidi Vici in the birthplace of Latin.